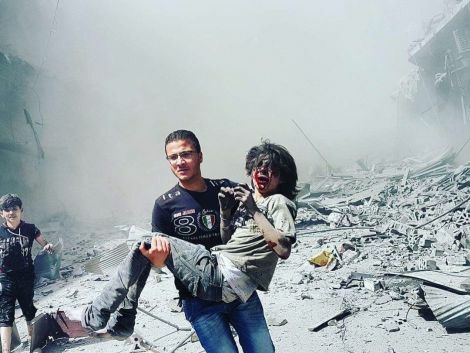 Aid agencies are calling for President Assad's regime and Russia to end the complete and systematic destruction of the rebel-held neighborhoods, where as many as 250,000 people are facing starvation. German FM Steinmeier denounces "cynical game" of the regime in Syria and rebuked Moscow for contributing to the "terrible humanitarian catastrophe" in Aleppo. The UN on Friday urged Russia to give it control of humanitarian passages out of Aleppo in northern Syria where besieged residents cowered indoors afraid to use what some call "death corridors" accusing Russia and the regime of forcing civilians to flee through continued bombing raids. "How can you expect people to want to walk through a corridor, thousands of them, while there is shelling, bombing fighting," UN envoy de Mistura told reporters, at a press conference in Geneva today. If Russia's planned humanitarian operation for Aleppo is a ruse, it risks disrupting U.S.-Russian efforts to achieve a political solution to end the five-year Syrian civil war, the United States said on Friday. United States officials have suggested Russia's operation may be an attempt to depopulate the city and to make fighters surrender. "It has the risk, if it is a ruse, of completely breaking apart the level of cooperation," US Secretary of State John Kerry told reporters. Asked if he thought the operation was a ruse, Mr Kerry added: "We are deeply concerned about the definition, and I have talked to Moscow twice in the last 24 hours". "The regime uses massive, indiscriminate force to brutalise civilians to force them to kneel or reject the rebel groups", he added. 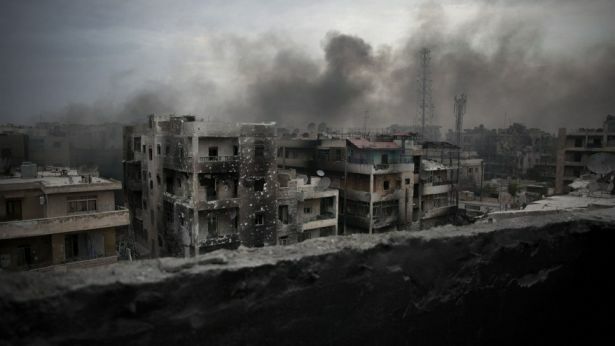 Rebel fighters were forbidding people from using the Bustan al-Qasr crossing, in the north of the city, "out of fear for their safety", according to Khaled Khatib, a volunteer for the Civil Defense search-and-rescue brigade. He said civilians who leave the city risk being shot by government snipers or being detained due to their opposition sympathies. The group said the hospital was damaged and there were initial reports of casualties. The US-based International Rescue Committee warned that those left behind in east Aleppo risked starvation. "The people of Aleppo should not be forced to choose between fleeing their homes and remaining under attack in a besieged area," said IRC's acting Middle East director Zoe Daniels. Analyst Karim Bitar from the French think-tank IRIS said: "Aleppo residents are facing a terrible existential dilemma, they often have to chose between risking starvation or risking to die while fleeing." Syria’s and Russia’s creation of humanitarian corridors to evacuate civilians besieged in eastern Aleppo in Syria does not relieve them of their obligation to avoid civilian casualties and allow aid to those who remain. Unlike other besieged portions of Syria (such as East Ghouta) the rebel-held pocket in Eastern Aleppo contains little to no open land that can be used for agriculture. This means that those trapped could begin to experience the effects of starvation in a matter of weeks. 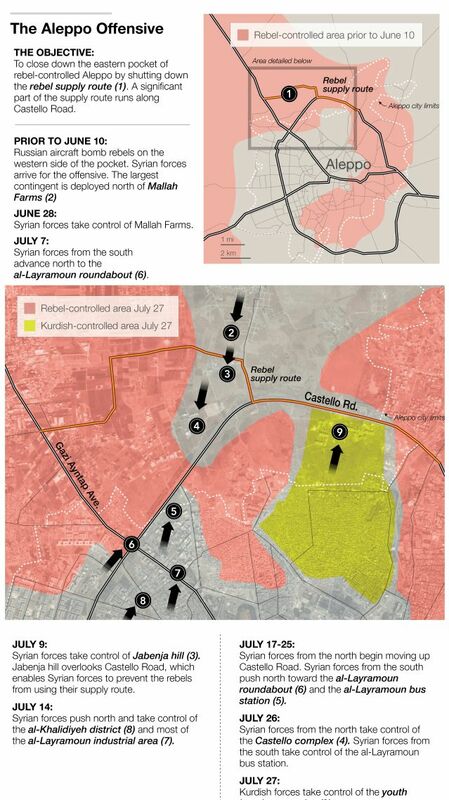 Indeed it is likely the strategy of the regime and its allies (Hezbollah, IRCG, and other Shia militias) to attempt to ‘starve out’ the rebels still holding positions within the city. Such tactics have already seen success in other areas of Syria including Homs. 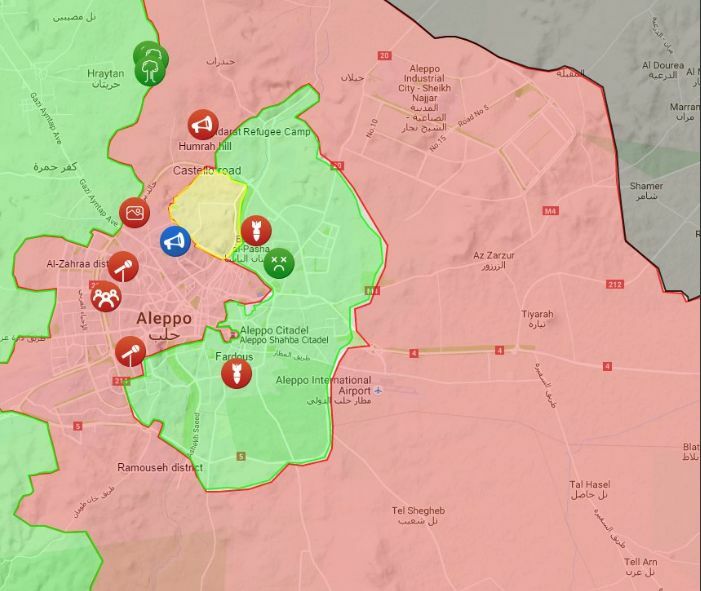 Eastern Aleppo, as part of Syria’s largest city, is a highly strategic battlefield for both sides. Through maintaining possession of this area, the rebels have continued to show that they can contest major population centers in the country. Should they lose it (as now seems likely) the existential threat which they pose to the Syrian Government will be significantly diminished. Moreover, the loss of Eastern Aleppo would see the Syrian rebels being localized to Idlib Province and parts of the country’s south. The long term strategic concerns however, will play second fiddle to the immediate humanitarian suffering within Aleppo. Unless some sort of negotiated ceasefire is agreed to, the coming months will see an increasingly deadly endgame, both for the remaining rebel fighters, and for civilians.